Library Tech Talk is happy to welcome a guest author, Towson University Albert S. Cook Library’s current Residency Librarian for Diversity and Innovation, Sarah Espinosa! Sarah has been rotating through departments in the library during the first year of her residency, contributing to a variety of projects and services in Research & Instruction, Archives & Special Collections, and Technical Services. Here on Tech Talk, she shares with us how she keeps all those projects organized! 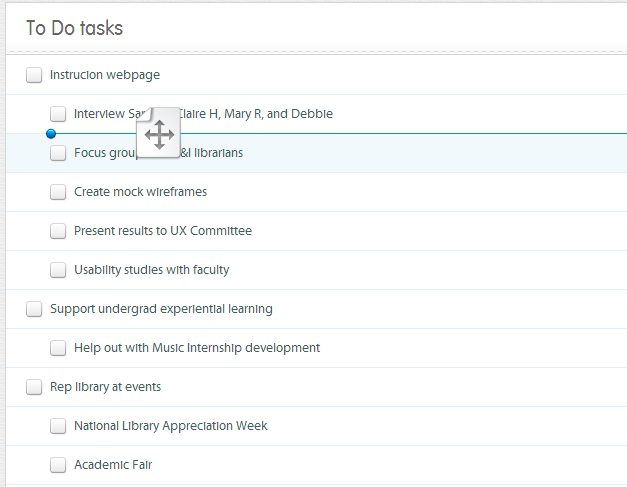 Academic librarians manage multiple projects with greater complexity than the traditional to-do list can handle. Projects have collaborators, tasks and sub-tasks, due dates, communication plans, required resources, and more. I’m finding paper organizers too limiting for constantly developing projects. However, the tools we use for office communication and organization (the Microsoft Office suite, Google apps) don’t cut it, with their limited task structure. Students experience the same challenges as they face more collaborative and experiential projects in their disciplines. So I looked for free project-management applications online that I could use and recommend to others. After using Cloudship for a couple months, I’ve decided that it works well as a web-based application for limited personal project management. Cloudship can be utilized as a desktop application, a web application and a mobile app. I use the web application to manage my work projects, which I like because of the option to create sub-tasks, notes, tags, and due dates. 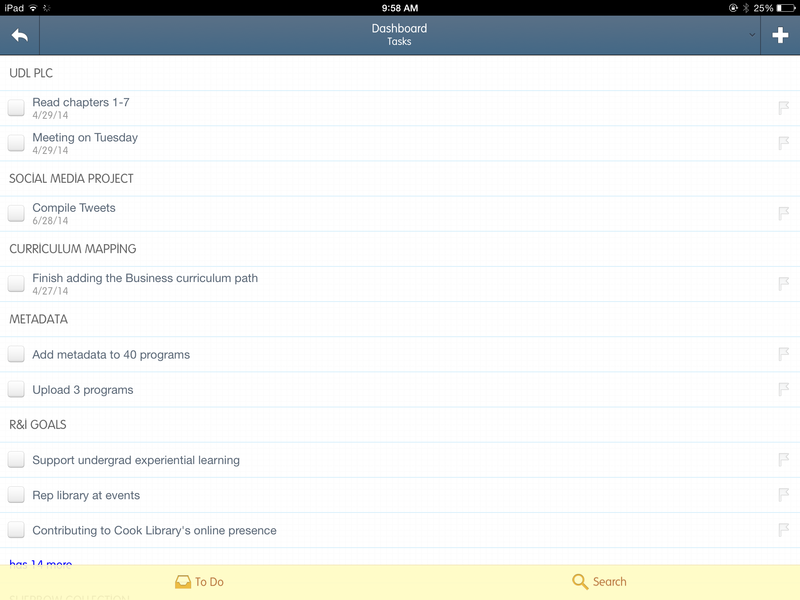 The dashboard of the web-based Cloudship app. I enter a task in the top text bar, and then I simply drag-and-drop the task into the correct project. 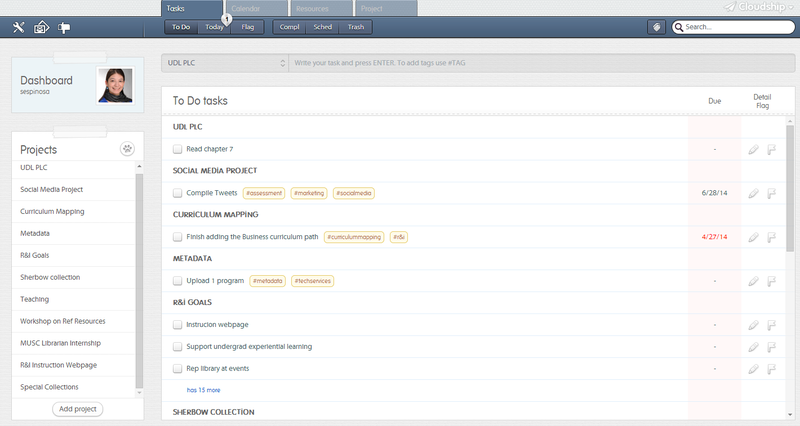 Or, to add tasks within one project, I select it from the left sidebar. The drag-and-drop method makes it easy to reorder tasks by date or in order of importance, and to drag tasks beneath others to create sub-tasks. I can filter my tasks using the To Do, (due) Today, Flag, Completed, Scheduled, and Trash buttons at the top of the screen. The search filter for tagged tasks works extremely well. Drag-and-drop a task beneath another to create a list of sub-tasks. I haven’t utilized a lot of Cloudship’s functionality, which includes linking resources to my project, adding details and collaborators to projects, and sending communications between collaborators. Since I’ve been using Cloudship as a personal project manager, I’m not sure how well the collaboration aspect works. I also have not used the resource tab. It makes more sense to add a resource directly to a task, instead of having a free floating list of resources. Also, Cloudship doesn’t handle URL resources well. The thing that really bothers me is the calendar: there’s an option to use a Cloudship calendar, if you create a paid account, but Cloudship doesn’t integrate with my Outlook or Google calendars. Even so, Cloudship has been exactly what I’ve needed so far–a task manager that allowed for more complex task structures and the flexibility offered by a cloud-based manager. Because of that, I thought I’d try the mobile version. Unfortunately, a lot of the functionality and ease of use I appreciate in the web application just isn’t there in the mobile app. To access my project list, I click the arrow in the top-left corner; to add tasks, I click the plus sign in the upper-right corner; and to navigate between Tasks, Projects, and Resources, I click a tiny arrow next to the plus sign. It isn’t impossible–just clunky. I find myself having to constantly switch which sidebar or window I’m using because I’m always in the wrong section. The app makes no use of the swipe gesture or the ease of drag-and-drop. Worst of all, I can’t figure out how to create sub-tasks. This deficiency differentiates between Cloudship’s mobile and web versions, and as a developing mobile user–and a librarian recommending apps to students for their own project management purposes–it’s enough to make me jump ship and try out something else. Applications like Wunderlist and Trello make better use of drag-and-drop, swiping, and sub-tasks. I’ve also noticed that there’s a lot of Cloudship community support and suggestions, with frequent response from developers, about a year ago–then everything stops, which leads me to wonder if Cloudship is still developing. It would be sad if this project were abandoned, because it has potential. However, other apps have both web and mobile ease-of-use, while Cloudship is better used as a web application. Are you interested in contributing a guest post to Library Tech Talk? Contact kimberlymiller [at] towson [dot] edu for more information.